This pair of bottles is made by jointing two wooden parts made by a pottery lathe. Each neck of the bottle is laced with patterns of chrysanthemum flower. 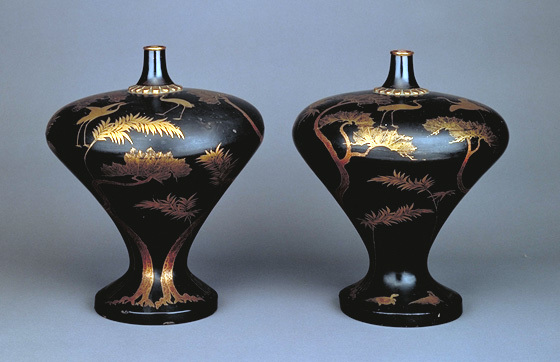 The auspicious scene known as the Hōrai-zu is represented with gold lacquer painted on a black lacquered base of the bottles. Pine and bamboo trees, pairs of cranes and turtles are depicted in gold. Trunks of pine trees, bamboo knots and veins of bamboo leaves are depicted using a different lacquer technique for each of them. The variety of maki-e techniques applied on the bottles is characteristic of the work from the Momoyama period. It is believed to have been once treasured at Kurama Shrine in Kyoto.